The lives of many disabled people in Europe and North America have improved over the past two decades through innovative technologies and the efforts of the disability rights movement. These changes have been spreading to other societies around the globe—albeit unevenly. 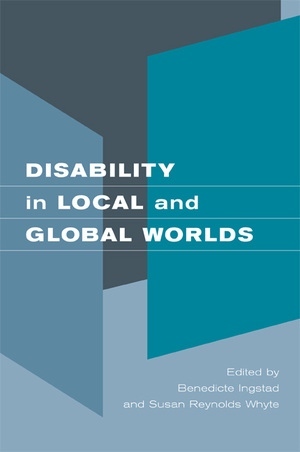 In this collection of essays, leading scholars explore global changes in disability awareness, technology, and policy from the viewpoint of disabled people and their families in a wide range of local contexts. The authors report on ethnographic research in Brazil, Uganda, Botswana, Somalia, Britain, Israel, China, Egypt, India, and Japan. They address the definition of disability, the new eugenics, human rights in local contexts, domestic and state citizenship of disabled people, and issues of identity and belonging. Benedicte Ingstad is Professor of Medical Anthropology at the Department of General Practice and Community Medicine at the University of Oslo. She is author of Community-Based Rehabilitation in Botswana: The Myth of the Hidden Disabled. Susan Reynolds Whyte is Professor at the Institute of Anthropology at the University of Copenhagen. She is author of Questioning Misfortune: The Pragmatics of Uncertainty in Eastern Uganda and coauthor, with Sjaak van der Geest and Anita Hardon, of Social Lives of Medicines. Together, Ingstad and Whyte coedited Disability and Culture (UC Press).